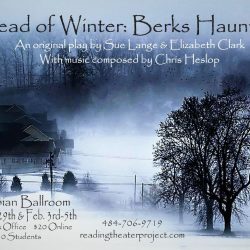 Reading, PA — Building on its reputation for creating new and exciting theater that is relevant to the Berks County community, the Reading Theater Project proudly announces its upcoming production, DEAD OF WINTER: Berks Haunting this January 27th-29th, 2017 and February 3rd-5th, 2017 at the Olympian Ballroom, 603 Penn Ave, West Reading PA, 19611. Directed by Joel Richard Gori RTP’s new play, by Sue Lange and Elizabeth Clark, DEAD OF WINTER: Berks Haunting, will draw on haunting folk-lore of the forgotten people of Berks County’s history including the Lenni-Lenape, slaves, abolitionists, and beatniks between the 1700’s and 1950’s. “Doing research for Dead of Winter has been another great experience,” says resident playwright Sue Lange. “As is true of most of Reading Theater Project’s pieces, we delve into Reading’s past and discover amazing facts and wonderful secrets about our area. I can’t wait to present this to the public.” This ensemble piece continues RTP’s success of Berks-inspired historical pieces that include 2013’s, May Be Honest, and 2014’s audience favorite, Speakeasy. The production boasts a wide array of the company’s talent with newcomers joining the ranks of RTP’s collective of theatrical artists. The cast is comprised of regional actors; Margot Adams, Vicki Haller Graff, Nina Kendall, Kyle Lewis, Christopher David Roché, Nelly Torres, and Amy Young. In addition to Gori and his cast, the production team includes: Christine Cieplinski (Costume Designer), Abbie Davies (Assistant Stage Manager), Craig Dodge (Lighting Designer), Andrew Pochan (Scenic Designer), Kris Savell (Production Stage Manager), and Chris Heslop (Music Director); who is creating an original score for the production.